The British Trust for Ornithology is asking people to look skywards-at cliffs, crags, pylons and cathedral roofs-as part of its survey of peregrines, to which both raptor specialists and casual birders can contribute. The mighty peregrine, whose comical black moustache belies its ruthless instincts, is a versatile hunter; it swoops, at speeds of up to 150mph, on waders and small wildfowl on the East Anglian marshes and on puffins and guillemots on wild, rocky northern outcrops, as well feasting on plump pigeons and the odd sandwich in Manchester. 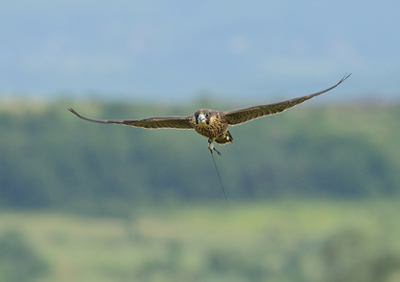 The bird’s fortunes have improved dramatically from the time of the BTO’s first survey, in 1961, when it was threatened by organochlorine pesticides and persecution, yet the message from the most recent survey, in 2002, when 1,400 pairs were recorded, is mixed: although its breeding range has generally expanded, the peregrine appears to have declined in north and west Scotland, North Wales and Northern Ireland. For information, telephone 01842 750050 or visit www.bto.org.